The world-famous Cape Henry Lighthouse has stood watch over the Virginia's coast for over 150 years. With a distinctive look, an imposing height, and a light that's visible for many miles around, the Cape Henry Lighthouse is one of the finest coastal installations in the USA - and now, thanks to our dedicated Amish woodworkers, you can bring a taste of this incredible heritage to your garden, dock, or entryway. 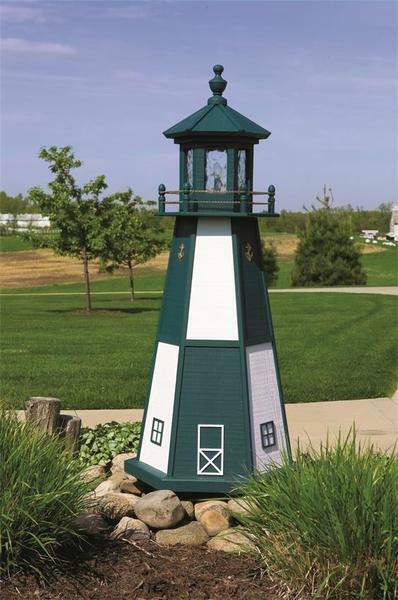 Choose from our wide range of sizes, colors, and lighting options to create your perfect garden lighthouse or order this as a gift for that someone special in your life. 18" - 8" x 9"
2' - 12" x 14"
3' - 15" x 17"
4' - 19" x 22"
5' - 24" x 27"
6' - 26" x 31"
8' - 33" x 38"
10' - 44" x 50"
18" - 5" x 6"
2' - 8" x 10"
3' - 11" x 13"
4' - 15" x 18"
5' - 19" x 22"
6' - 22" x 27"
8' - 26" x 31"
10' - 36" x 42"
2' - 8" x 13"
3' - 9" x 16.5"
4' - 13" x 22"
5' - 14.5" x 25.5"
6' - 15.5" x 29"
8' - 16.5" x 36"
10' - 18" x 46.5"
I was so surprised that my father said he received the lighthouse yesterday . He secretly set it up in their backyard last night so when my mom opened the shades in the morning she would see it. He videotaped her opening up the curtains this morning to see the brand new lighthouse and she was crying with joy. She loves it. Tonight she will get to see how the solar lighting feature works. She can’t really walk outside for a closer look but she sits at the table and looks out the window all day long. Tell the wood crafters we all appreciate the great job they did in making the lighthouse and shipping it so carefully. !! !